Most people collect baseball cards or stamps, but author Jonathan Eig collected Muhammad Ali. From stories, to photos, to coveted memorabilia—including an exceedingly rare Heavyweight Champion token—the author pieced together a complex picture of Ali’s life. 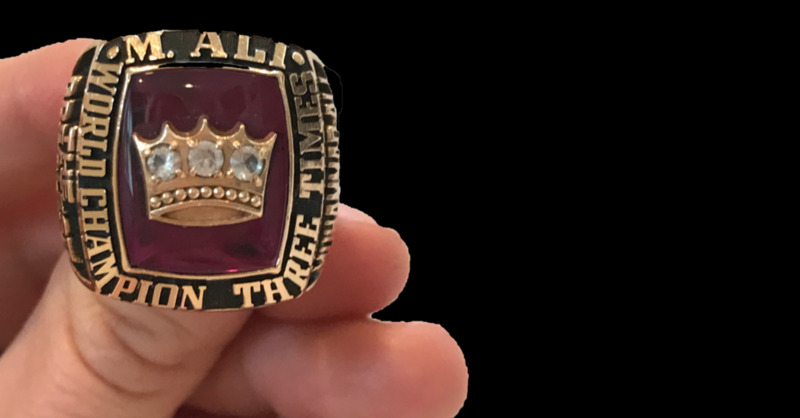 In the latest episode of our podcast, Eig takes us on a tour of some of his most meaningful Ali keepsakes, and tells the story behind one especially distinctive treasure. See a few of the items we discussed with the author below. An autographed glove from Eig's collection of Ali memorabilia. Just a few of Ali's magazine covers from Eig's massive collection. Muhammad Ali's three-time heavyweight championship ring. He gave a few of these to members of his entourage. Learn more about what Muhammad Ali's life growing up in Louisville was like in Eig's book: "ALI: A Life." Preorder your copy via the link below.